Up until the 1950s, the classification of soils in Canada was based on the system used in the United States. However, it was long recognized that the U.S .system did not apply well to many parts of Canada because of climate and environmental differences. The Canadian System of Soil Classification was first outlined in 1955 and has been refined and modified numerous times since then. 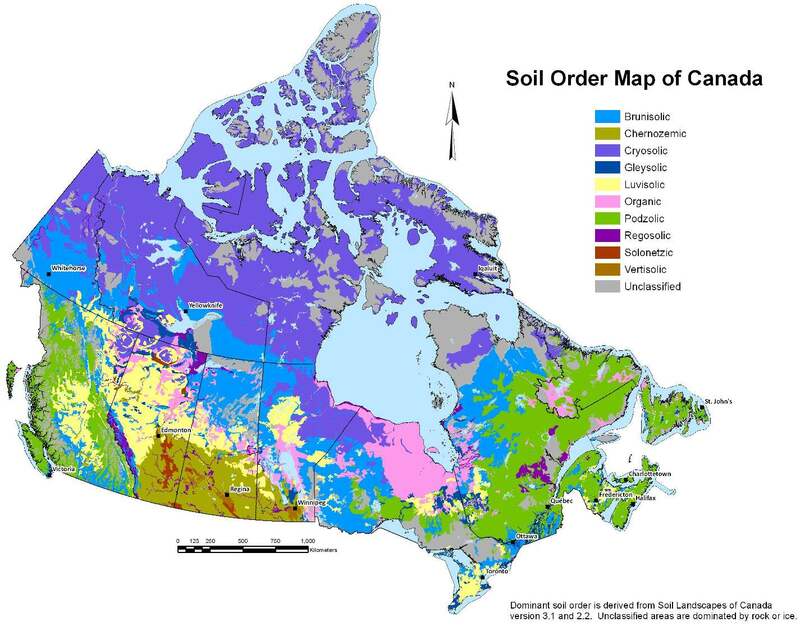 There are 10 orders of soil recognized in Canada. Each one is divided into groups, and then families, and then series, but we will only look at the orders, some of which are summarized in Table 5.2. The distribution of these types of soils (and a few others) in Canada is shown in Figure 5.19. Brunisol Poorly developed or immature soil, that does not have the well-defined horizons of podsol or luvisol Boreal-forest soils in the discontinuous permafrost areas of central and western Canada, and also in southern B.C. There is an excellent website on Canadian soils, with videos describing the origins and characteristics of the soils, at: http://soilweb.landfood.ubc.ca/classification/. As we’ve discussed, the processes of soil formation are dominated by the downward transportation of clays and certain elements, and the nature of those processes depends in large part on the climate. In Canada’s predominantly cool and humid climate (which applies to most places other than the far north), podsolization is the norm. This involves downward transportation of hydrogen, iron, and aluminum (and other elements) from the upper part of the soil profile, and accumulation of clay, iron, and aluminum in the B horizon. Most of the podsols, luvisols, and brunisols of Canada form through various types of podsolization. In the grasslands of the dry southern parts of the prairie provinces and in some of the drier parts of southern B.C., dark brown organic-rich chernozem soils are dominant. In some parts of these areas, weak calcification takes place with leaching of calcium from the upper layers and accumulation of calcium in the B layer. Development of caliche layers is rare in Canada. Organic soils form in areas with poor drainage (i.e., swamps) and a rich supply of organic matter. These soils have very little mineral matter. In the permafrost regions of the north, where glacial retreat was most recent, the time available for soil formation has been short and the rate of soil formation is very slow. The soils are called cryosols (cryo means “ice cold”). Permafrost areas are also characterized by the churning of the soil by freeze-thaw processes, and as a result, development of soil horizons is very limited. Examine Figure 5.19, which shows the distribution of soils in Canada. In the following table, briefly describe the distributions of the five soils types listed. For each one, explain its distribution based on what you know about the conditions under which the soil forms and the variations in climate and vegetation related to it. 5.5 The Soils of Canada by Steven Earle is licensed under a Creative Commons Attribution 4.0 International License, except where otherwise noted.